Literary web series Classic Alice is thrilled to announce that they've teamed up with The Horizon Factory to create the Classic Alice app - an interactive, unified platform that will allow the show to live on long after Alice's final video. This groundbreaking format will allow fans to experience the show as it happened, with all the videos and transmedia in chronological order - or to skip around on an easy-to-navigate timeline and follow certain storylines, characters, types of media, and more! As show creator Kate Hackett explains, “Before, these types of shows would live once and be very hard to recreate; The Horizon Factory’s app creates a vehicle to keep Classic Alice’s story organic and relivable.” It's the perfect way for fans to revisit their favorite moments for the fifth or five hundredth time, and for new viewers to jump into the world of Classic Alice! The app gives fans the easiest, most cohesive way ever to watch the show and experience all the transmedia in order, as well as a huge amount of extra content - much of it never before seen - gathered into one place. 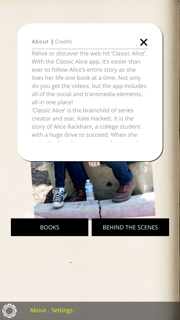 In addition to offering 150+ videos (including spinoff Musica Mundana) and characters' tweets, Tumblr posts, and podcasts, the app lets fans delve into characters' personal diaries, cook from Cara's cookbook and listen to her playlists, read Alice's entire novel, and peek at notes and emails between the characters as well as Alice's posters and presentations, Ewan's comics, and more! 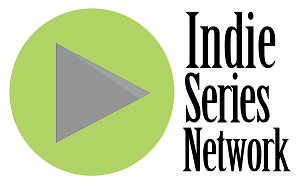 Each arc comes with a rich reservoir of out-of-world bonus content, including a new behind-the-scenes featurette; scripts, notes, and outlines; cast commentary; premiere and photoshoot photos; and new interviews, bloopers, and much more. The Classic Alice app is expected winter 2015/2016 in the iTunes store for iPhone and iPad. It is free to download and includes the prequels and Alice's first arc, Crime and Punishment - FREE! - complete with transmedia and bonus content. Users can buy subsequent arcs as in-app purchases; the second book, Pygmalion, will be available for $4.99, and books three through thirteen will be released soon with price points ranging from $2.99 to $8.99, depending on the length of the arc. And community is built right in: users can interact with fellow fans as they move through the app, easily share chapters and moments to social media, and receive notifications when new content is added, so they don't miss a thing!